In the continuing debate of how to confront the challenges of climate change, individuals, advocacy groups, and political parties in the United States offer arguments and solutions based on economic and political viewpoints. But what if we are beginning from a distorted view? In this book, F. Stephan Mayer argues that our psychological representation of the world is at the heart of the underlying causes of climate change. Mayer posits that we need to change the way we see the world if we are to effectively take a new course of action to address this threat. Through an alternative worldview based on Aldo Leopold’s concept of land ethic, Mayer furthers the conversation by promoting a clearer vision of our relationship to nature and how it leads to a different path directed toward environmental sustainability. 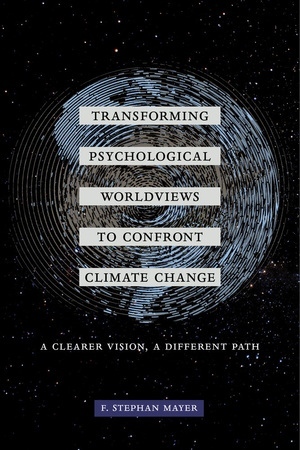 Based on over 20 years of psychological research examining the impact of the land ethic on pro-environmental behavior and personal well being, Mayer’s accessible tone invites readers to place their worldview within a broader framework, draw connections to their lives, and spark ideas of next steps that individuals and groups can take to transition to this alternative worldview and rectify this situation. F. Stephan Mayer is Professor of Psychology and Peace Studies at Oberlin College.